Icon Case Pouch Coin Purses Tapestry Prayer With Nazareth Annunciation Church 5.7"
This beautiful tapestry pouch is pictured Nazareth Annunciation Church on both sides . This icon pouch, lined with a zipper for closing, is perfect as a rosary or prayer rope case. 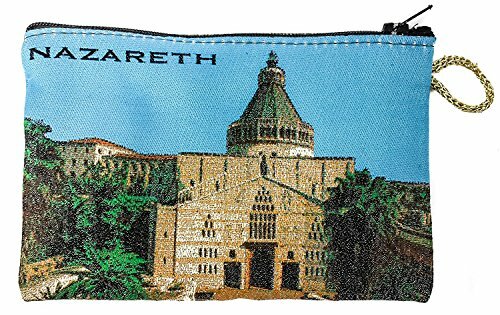 This beautiful tapestry pouch is pictured Nazareth Annunciation Church on both sides. This icon pouch, lined with a zipper for closing, is perfect as a rosary or prayer rope case. Icon Case Pouch Coin Purses Tapestry Prayer With Jewish Hamsa Evil Eye Protection 5.7"